A man who repeatedly stabbed his former girlfriend in a jealous rage as she tried to fight him off has been jailed for life for her murder. 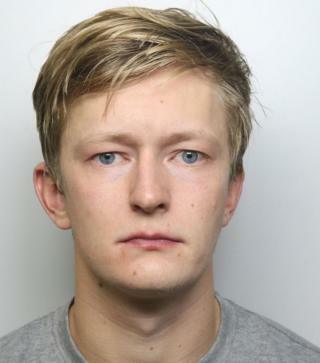 Joe Atkinson attacked 24-year-old Poppy Devey Waterhouse with a kitchen knife at the flat they shared in Leeds. Described as a "prodigiously gifted mathematician", she had more than 100 injuries, Leeds Crown Court was told. Atkinson, 25, who admitted murder, was told he will serve a minimum of 15 years and 310 days. In a victim impact statement, her mother Julie Devey said: "I kept stroking my hands across the floorboards where she had been left screaming and dying. "I just wanted to scoop her up and save her." She added: "I now live my life with a split screen. One half I can see the now, and on the other half that horrific scene." Describing the impact of her death, Miss Devey Waterhouse's father Rupert Waterhouse told the court that his daughter and son were the two "greatest gifts" of his life. He added: "How can a picture of my daughter, smiling at me with her brown eyes, hurt me so deeply? "This is my life sentence. Ours is a family of four minus one." The court was told the pair, who met at Nottingham University, had been together for three years but by late 2018 they had broken up at the request of Miss Devey Waterhouse, who was originally from Frome in Somerset. Both were seeing other people but prosecutors said Atkinson had failed to come to terms with the separation. While Atkinson was on a Christmas night out with colleagues on 13 December, maths graduate Miss Devey Waterhouse remained at the flat they still shared on The Avenue, chatting to her new boyfriend on the telephone. The court was told how, in the early hours of 14 December, Atkinson returned to the flat and attacked her. Forensic evidence showed Miss Devey Waterhouse tried to fight him off, but collapsed in the hallway. She had suffered about 70 knife injuries all over her body. Afterwards, Atkinson attempted to clean the scene and dispose of his clothes, only contacting the emergency services hours later. Jason Pitter, prosecuting, said: "Poppy Devey Waterhouse was a prodigiously talented mathematician - who was described as brilliant and beautiful - who, at the age of 24, had her whole life ahead of her. Det Supt Nicola Bryar, of West Yorkshire Police, said Atkinson's claim that the killing had been self-defence had soon unravelled. "We established that he had spent some significant time disposing of evidence and attempting to alter the crime scene over the hours before the ambulance service and police were called to the flat. "He has never explained why he did what he did, but he will now have a significant period of time in prison to reflect on what he has done and the hurt that has caused to so many people who knew and loved Poppy."